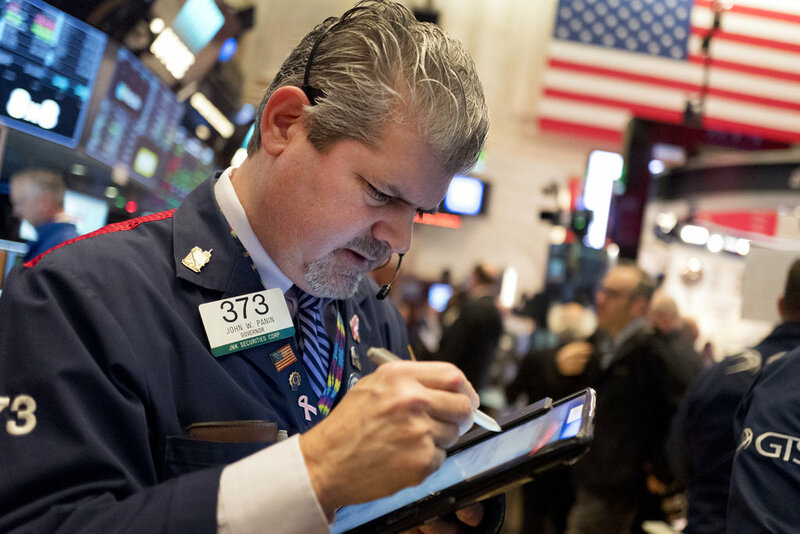 The major U.S. stock indexes were down slightly in early trading Monday, as losses in technology companies outweighed gains elsewhere. Energy stocks also declined as crude oil prices headed lower. Banks posted solid gains as bond yields rose. Investors were weighing the latest corporate deal news, including Keurig's acquisition of Dr. Pepper Snapple. KEEPING SCORE: The Standard & Poor's 500 index fell 8 points, or 0.3 percent, to 2,864 as of 10:09 a.m. Eastern Time. 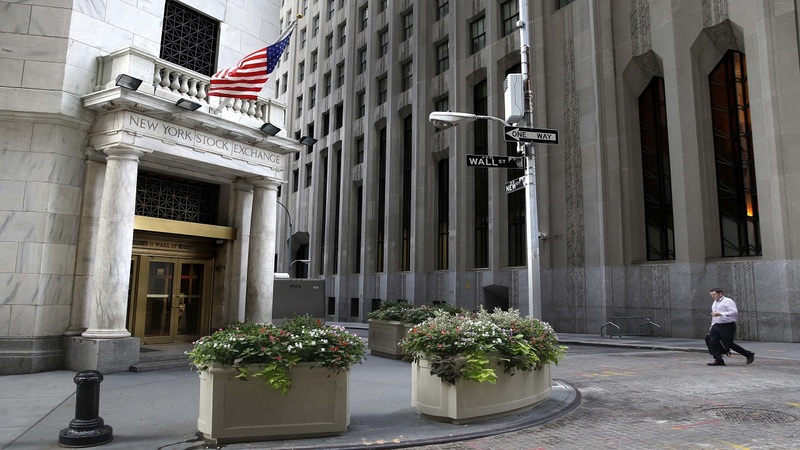 The Dow Jones industrial average slid 62 points, or 0.2 percent, to 26,554. The Nasdaq composite lost 25 points, or 0.3 percent, to 7,480. The Russell 2000 index of smaller-company stocks picked up 1 point, or 0.1 percent, to 1,606. The stock market is coming off its biggest single-day gain since March 2017. DRINK IT UP: Dr. Pepper Snapple Group jumped 29 percent after it agreed to be acquired by Keurig for $16.6 billion, including debt. The deal would create a beverage giant with about $11 billion in annual sales. The companies, both the result of previous mergers, would combine global brands like Dr. Pepper, 7UP, Snapple, A&W, Mott's, Sunkist and Keurig's single-serve coffee makers. Dr. Pepper Snapple shareholders will receive $103.75 per share in a special cash dividend and keep 13 percent of the combined company. 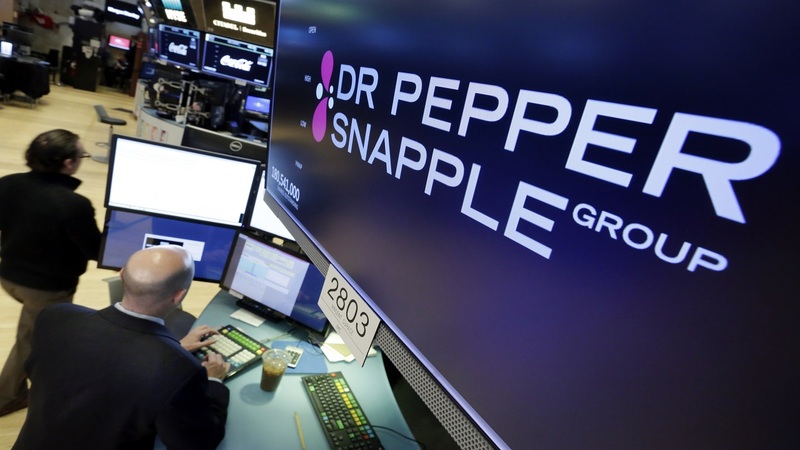 Dr. Pepper Snapple shares added $24.05 to $119.70. STRONG QUARTER: Lockheed Martin was up 2.3 percent after the defense contractor's latest quarterly results beat financial analysts' expectations. The stock added $7.85 to $352.75. TECHNOLOGY SLUMP: A slide in technology sector stocks accounted for much of the market's decline. Lam Research lost $4.49, or 2.2 percent, to $198.08. ENERGY: Benchmark U.S. crude fell 57 cents to $65.57 a barrel on the New York Mercantile Exchange. It rose 63 cents on Friday. Brent crude, used to price international oils, dropped $1.09 to $69.43 per barrel. The slide in gas prices weighed on energy sector stocks. Chesapeake Energy fell 5 cents, or 1.2 percent, to $3.95. BOND YIELDS: Bond prices fell. The yield on the 10-year Treasury note rose to 2.70 percent from 2.66 percent late Friday. The rise in bond yields helped lift shares in banks and other financial companies. Goldman Sachs gained $3.30, or 1.2 percent, to $271.44. CURRENCIES: The dollar, which last week fell sharply after U.S. officials said they accepted a weaker value for the currency, rose to 108.82 yen from 108.66 late Friday. The euro fell to $1.2356 from $1.2423. The ICE US dollar index is at three-year lows and has declined for six consecutive weeks. THE BITCOIN TRADE: The price of bitcoin was down about 4.2 percent in morning trading Monday to $11,206, according to the tracking site CoinDesk. Bitcoin futures on the Cboe Futures Exchange were up 1.9 percent to $11,150. The futures allow investors to make bets on the future price of bitcoin.